Running a marathon can be described as vastly different from racing a marathon. Running a marathon describes the majority of runners, whose goal is to participate and finish a marathon event, perhaps running with a friend or raising money for a charity. Racing would be defined as the competitive pursuit of a top result in an event or category, reaching a goal time, or qualifying for a specific event like the Boston Marathon. Marathon participation in any form is a challenge, and whether winning your age group or completing your first 26.2 event, it is something every athlete should appreciate. However, when you decide to commit to competitive marathon running, there are three strategies to focus on to reach your goals. These steps include race preparation, completing marathon specific workouts, and mental skill development. Specific preparation is essential training for any endurance event. Competitive marathon runners should focus on three particular aspects of preparation: course research, nutrition management, and weather conditions. Course research includes a detailed course profile review to determine if hill training is required and to identify strategic points along the course at which to monitor performance. Hill preparation would include both uphill and downhill running. It’s been said that in a race, for every uphill there’s a downhill. However, that downhill doesn’t always directly follow the uphill and there are many point to point marathons where that is simply not the case. Marathon training should include hill training to the mimic the course not only in gradient, but at what point the gradient occurs on the course. This is achieved by mapping out long run routes to include hills at similar point in the course. Nutrition management can be simplified down to what you can eat before the race, the nutrition you can use during the race, and which nutritional products are offered during the race. Pre-race meals should include enough calories to provide fuel throughout the race with minimal supplementation. These meals should be tested before race day. Use interval workouts and long runs to adjust for any gastrointestinal issues. Since it may be a disadvantage to carry bottles during your marathon, you need to find out which products will be provided at stations along the course. Most runners have very strong opinions about what drink they prefer during training and racing. The event may offer a different product, which is normally provided by a sponsor. Many of you can adjust to the flavor and ingredients provided in a drink by simply training with that product for four to six weeks prior to race day. If you cannot adjust to the provided drink then refrain from using it. Hydrate with only water and evaluate other nutritional options such as gels or chews. The final component of event specific race preparation is knowing the weather conditions and preparing your clothing options. Review the past five years to establish what conditions are most likely to occur during the event. This information is used to prepare multiple clothing options for race day that have been tested previously in training. Layering is normally an excellent option, but when racing, it doesn’t allow for easy adjusting because of race numbers or carrying removed apparel you may need later. At race intensity, most athletes will be sufficiently equipped with sleeves, gloves, and hat for cold conditions. These items allow easy race adjustments for wind, rain, and temperature changes during the event. Accommodations should also be made for post-race clothing to aid in recovery and provide sufficient warmth following the event. Proper preparation is vital for all marathoners, but for the competitive athlete is can mean valuable minutes or places. Developing a training plan for marathon racing is different than trying to simply reach the finish line. At this level, utilizing a coach is recommended. There are key training sessions that will prepare you for racing a marathon. The long run is always part of a distance runner’s training plan. For the competitive marathoner, a minimum of 20 to 24 miles is recommended and a 25 to 27 mile run is ideal. The maximum long run should be scheduled three weeks prior to the event before beginning the taper period. A three week taper period has been proven in research1 to improve performance by three percent which can account for over a six minute improvement on a 2:45 marathon. Another long run workout that can be incorporated is the fast finish long run. This run starts as a typical long run at your aerobic pace, about 60 seconds to a 90 seconds slower than goal pace. The last 3 to 10 miles are run at goal marathon pace. This should be planned progressively over the preparation period leading to the taper period. The training plan can be designed so that you alternate a steady pace long run one week, with a fast finish run the next week. The distance of the long run and following fast finish run are increased every other week during the steady run. Long distance workouts should be supplemented during the week with one to two workouts comprised of fartlek workouts or interval workouts. Interval workouts should progress in volume and focus on improving lactate threshold pace, which can be based on your 5km race pace. Improving lactate threshold is essential to increasing your running efficiency, defined as increased speed potential at sustainable effort. Fartlek workouts are structured with bouts of varied speed at plus or minus 20 percent of goal marathon pace. Fartlek intervals mimic the pace changes encountered during the race. Marathons require long range planning of 8 to 10 weeks for actively competitive runners and up to 20 weeks for those specifically targeting an event. The use of TrainingPeaks and a coach are instrumental in creating the plan, monitoring your progress, and using different training metrics to evaluate and adjust the plan. A strong mind is key to competitive success in any sport. 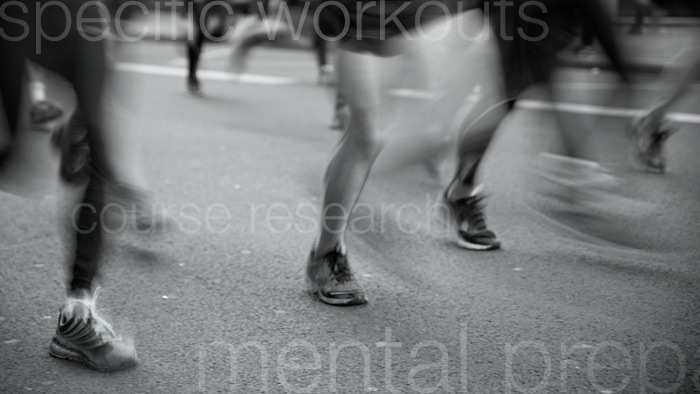 For marathon racing it is particularly important to develop specific mental skills. Racing a marathon requires focus when adjusting your pace to the conditions and competitive environment, as well as monitoring physical performance. This includes hydrating appropriately. Good hydration can be a key performance booster or limiter based on your ability to recognize the opportunities to hydrate properly throughout the race. This occurs through attentive focus to the same details during training and visualizing the process of entering a water station, taking in water, and acquiring a sense of volume needed and actually ingested. You can develop this type of focus by planting water bottles along your long run route or running the workout in loops with a water station set up. It can be further enhanced by simulating the race time of day and environmental conditions to better tune your mind and body into how much water to take in at each opportunity. Be specific about your goals. This would be something like a specific qualifying time or maintaining a specific pace. Make the goal measureable. This would be a time, a pace, etc. and not something subjective like, “feel good through 18 miles”. Make sure your goals are aggressive but attainable. These will depend on your experience and ability to enhance your training plan. A coach or training partner is a great resource to ask if a goal may be a too easy or unreachable. Goals should be result oriented, so write them down to be reviewed. Written goals also serve as inspiration to push through the final eight miles of the long run at race pace or get a workout in on a rainy day. Limiting your goal to a specific time period is easier for marathons than other sports because it will be done at a race on a set date. To reach your racing goals, the number of events per year must be strategically planned. Running 26.2 miles takes an extraordinary amount of preparation and focus which athletes can improve by including a mental skills in their training plan. Finishing a marathon is a huge physical feat no matter how you approach it. There are those that want to take the next step to racing a marathon, not just crossing the finish line. By researching the race, preparing a proper training plan, and training specific mental skills great performances are possible.